Influenced by the Pointillist work of Georges Seurat, Pissarro originally painted this landscape entirely in small dots of color and dated it 87 in the lower right corner. The work remained in Pissarro's studio where, several years later, the upper left of the canvas was torn. The artist repaired the work and added a second date of 1902. 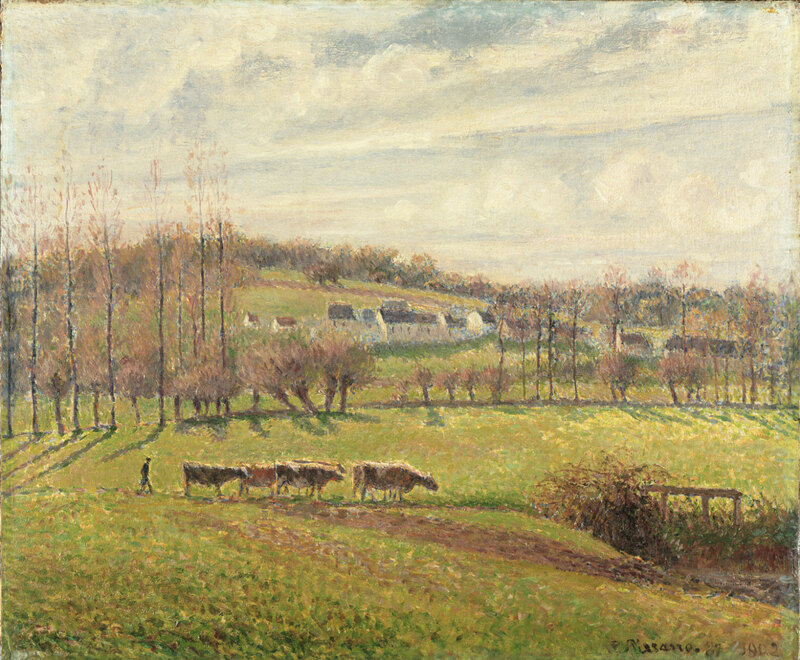 Because Pissarro had by then abandoned the Pointillist style, the repainted area of the painting—the sky—exhibits the looser, more Impressionistic style of his later years. This tranquil landscape occupied by a peasant and his cows holds many mysteries. In 1887 Pissarro painted a view of Éragny, a small village on the river Epte about ninety miles northwest of Paris, working in the Neo-Impressionist style with minute dots and strokes of color. Dated 1887 in the lower right corner, the painting was later damaged by a large gash along the left edge. The tear was repaired in 1902, when Pissarro added the second date and painted over large areas of the canvas. The reworked sections, including the sky, were painted with loose, wet brushstrokes that contrast with the small dabs of color from the earlier campaign, which are still visible in the foreground. In the intervening years Pissarro had abandoned the fussy Neo-Impressionist style, complaining that it was time-consuming and overly scientific. It also did not appeal to many collectors, and Pissarro had a family of six children to support. It is not known how the canvas came to be torn; it may have been a simple studio accident, or perhaps Pissarro struck it deliberately in frustration with the cumbersome Neo-Impressionist technique. Jennifer A. Thompson, from Masterpieces from the Philadelphia Museum of Art: Impressionism and Modern Art (2007), p. 60. Dr. Albert Charpentier, Paris, by 1930, until at least 1939 . R. Bernheim; sold to Wildenstein & Co., New York, 1956; sold to Mr. and Mrs. William I. Mirkil, Haverford, PA, 1957 ; Ruth Richmond Mirkil (Mrs. William I. Mirkil) (d. 1987); gift to PMA, 1961. 1. Charpentier exhibited the painting in the 1930 Pissarro centennial exhibition, and he is listed as the owner in Pissarro and Venturi's catalogue raisonné of 1939 (no. 1260). Not in his sale, Paris, Galerie Jean Charpentier, March 30, 1954. The PMA Bulletin (Fall 1964, p. 13) lists Georges Charpentier as a previous owner, but this is incorrect; Georges Charpentier died in the early years of the twentieth century and his collections passed to his daughters. 2. Provenance information per Joachim Pissarro and Claire Durand-Ruel Snollaerts, Pissarro: Critical Catalogue of Paintings, Milan and Paris, 2005, vol. 3, no. 852.